We at Golden Gate Audubon have spent a lot of time advocating for the endangered California Least Terns at Alameda Point. But there are about 180 other species of birds that call Alameda home too — including Brown Pelicans. 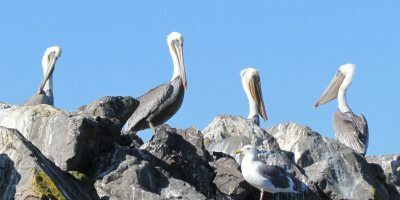 We’d like to share some wonderful photos and information about the pelicans by Alameda resident Richard Bangert, reprinted from his Alameda Point Environmental Report blog. The successful recovery effort for the once endangered California Brown Pelican is evident every summer through fall on Breakwater Island, an area which forms the beginning of the Alameda Point Channel leading to the ship docks and Seaplane Lagoon. The breakwater is a wall of boulders built up from the Bay floor to reduce wave action in the harbor. California Brown Pelicans were listed as an endangered species in 1970. The pesticide DDT was identified as the cause of their decline. It caused reproductive harm, and altered the birds’ calcium absorption, which led to thin eggshells that would break under the parents’ weight. Use of DDT was banned in the United States in 1972. A recovery effort was launched in the 1970s on Channel Islands National Park off the coast of Santa Barbara. 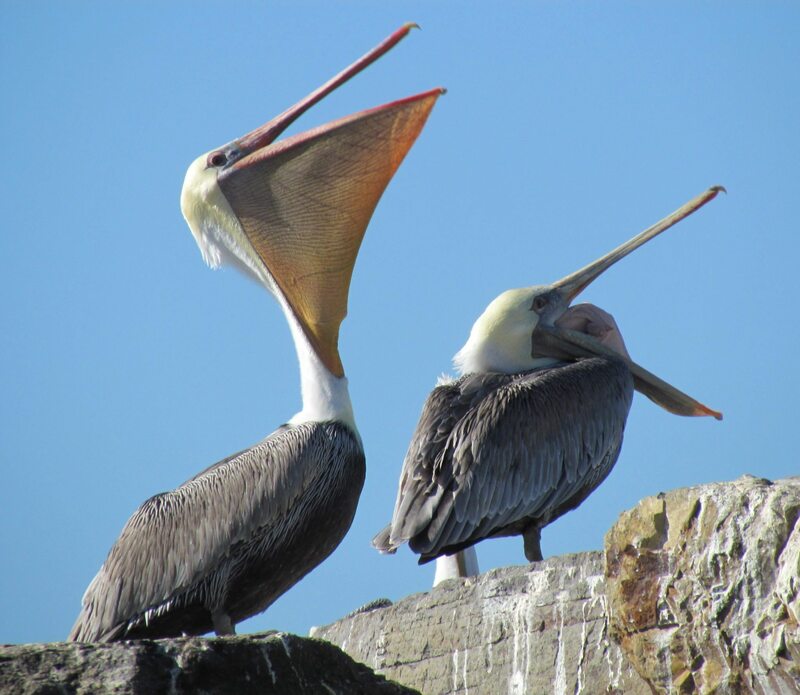 The only breeding colonies of California Brown Pelicans in the western United States are within Channel Islands National Park on West Anacapa and Santa Barbara islands. 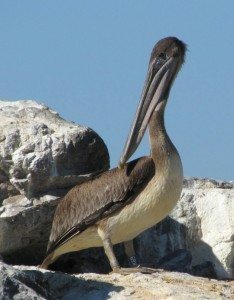 In the summer and fall, the Brown Pelicans can range from nesting colonies in Mexico and the Channel Islands all the way up to British Columbia. Alameda Point’s Breakwater Island is the largest roosting site in San Francisco Bay. A safe, secure roosting area is essential for pelicans to rest, preen, dry their feathers, maintain body temperature, and socialize. When the Naval Air Station was still active, the Navy enforced restrictions against boats landing on the Island and posted signs that warn against disturbing the birds. Since the base closed, there has been no one to enforce regulations against disturbing the pelicans. 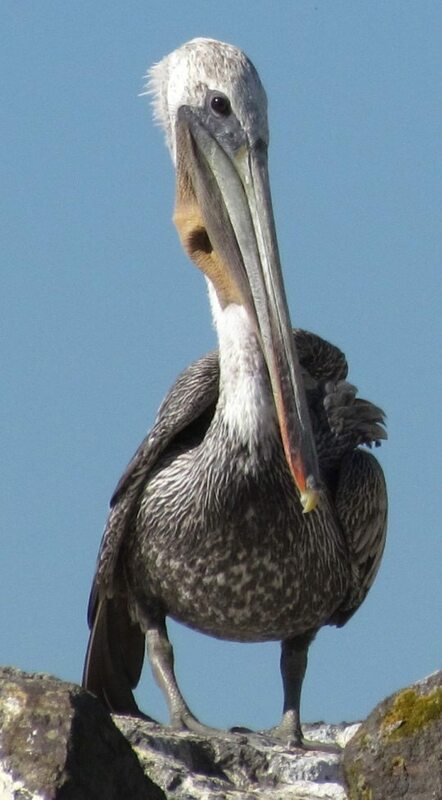 The California Brown Pelican was removed from the Endangered Species List in 2009 after an almost 40-year recovery. There is currently no plan to look out for the welfare of these magnificent birds after the base is transferred out of Navy ownership. One way to ensure adequate protection and provide public education and appreciation of this unique ecological asset is to have it be part of an “Alameda Point Wildlife Conservation Area.” The East Bay Regional Park District would be an excellent agency to manage it; they already have a marine conservation area at nearby Crab Cove. Want to get involved in securing the future of Brown Pelicans at Alameda Point? Contact Friends of the Alameda Wildlife Refuge, a Golden Gate Audubon committee. FAWR meets the third Monday of each month at 7:00 pm at the Alameda Point Building 1, Room 140. Close-up photos of Breakwater Island pelicans were taken in October 2012 from a kayak. View more Breakwater Island pelican photos in the Flickr photo set. 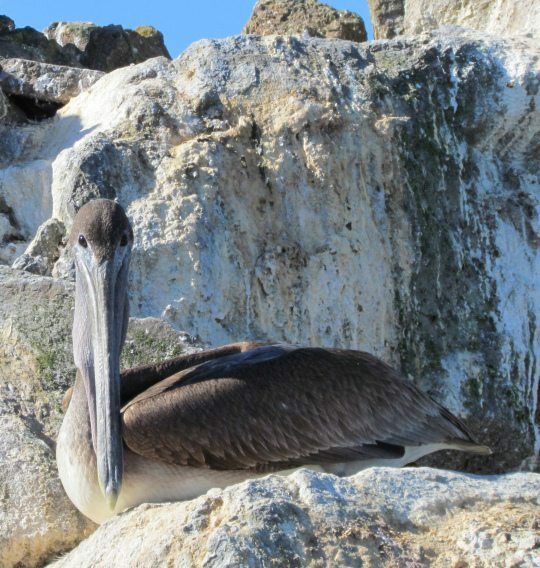 More information on Brown Pelicans is available on the Channel Islands National Park website. Note: The brown pelican pictured above with a leg band reading “K69″ was brought to the International Bird Rescue clinic in Cordelia near Fairfield, CA on July 9, 2012 in a thin and weak condition. It is less than a year old. After a one-month rehab, it was released at the Elkhorn Slough Estuarine Reserve near Watsonville on August 10. A blue band on a pelican leg means it was given a helping hand at one of the two clinics operated by International Bird Rescue, located in the San Francisco Bay Area and Los Angeles. Some of their released pelicans have been spotted in Oregon and Washington. If you see a pelican with a blue leg band, they’d like to hear about it.